MOON TOWNSHIP— The Robert Morris football team (2-5, 0-3) defeated the Central State Marauders (4-4, 1-3) on Saturday. 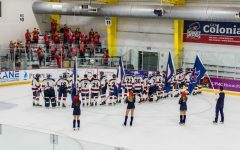 The Colonials came into the game after falling to Duquesne (5-3, 2-1) by the score of 48-24. The Colonials’ high octane offense came out of the gate strong as it took the Colonials only four plays to take a 7-0 lead over CSU. That drive was capitalized by a 41-yard touchdown run by Terence Stephens, who had a strong game overall. Unfortunately for Robert Morris, CSU completed a 55-yard pass on the first play of the next drive. That set them up at the one, and they scored three plays later to tie the game up at 7-7. The Colonials got the ball back on the CSU 26-yard line after a 67-yard kick return by Stephens. Two plays later, Jimmy Walker found Mathew Gonzalez for a 16-yard touchdown. 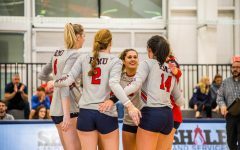 That made the RMU lead go to 14-7. The Colonials got the ball back and proceeded to drive down the field once again. For the second time today, Walker found Gonzalez for their ninth hook-up on the year. Gonzalez’s ninth touchdown moved him into third in the FCS total lead and extended the score to 21-7. Both teams then traded turnovers after a turnover-on-downs by CSU followed by an Alijah Jackson fumble to give CSU the ball back. CSU quarterback Trent Mays then completed a 41-yard pass to Kevin Greenhow to put CSU in scoring position. The quarter ended during this drive and RMU went into the second quarter up 21-7. The game resumed with CSU having the ball at the RMU seven-yard line. Central State failed to get into the end zone, but a pass interference call on Robert Morris kept the drive alive. Central State couldn’t find the end zone again, and they settled for a field goal by Trevor Teel to make it 21-10. 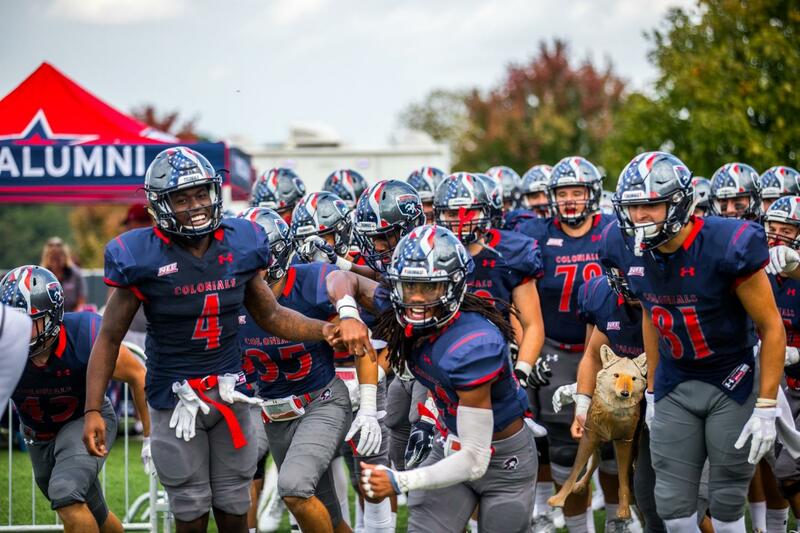 The Colonials made the Marauders pay for settling for a field goal after Walker found Brandon Magee for a 52-yard touchdown after a drive that stalled around midfield. The score gave Walker his third touchdown of the day and made the score 28-10. After RMU generated a turnover on the one-yard line, Terence Stephens was tackled in the end zone for a safety. This made the score 28-12 and gave CSU the ball back. Robert Morris’s defense held strong and EJ Jimenez blocked a CSU field goal to give RMU the ball back with under four minutes to go in the first half. The Colonials couldn’t do anything on their drive and CSU took the ball over and scored once again. CSU then successfully completed an onside kick and took over at the 26-yard line with 0:20 left. The Colonials held CSU to a field goal attempt though, which CSU missed, and the game went into halftime with a 28-19 RMU lead. Central State had the ball to start off the second half, and they drove down the field against the struggling Robert Morris defense, once again. They scored but decided to go for the two-point conversion despite being down by only three. They failed to convert and the score stayed at 28-25. The shootout continued as Walker found Gonzalez for his third touchdown of the day. 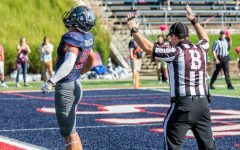 That touchdown tied Matthew Gonzalez with the single-season receiving touchdown record (10) in RMU history. The other was Tyjaun Massey from the 2005 season. That score made it 35-25. The two teams traded turnovers and CSU capitalized when they got the ball back for another touchdown to Kevin Greenhow. Greenhow, at this point, had 206-yards receiving on seven catches and two touchdowns. 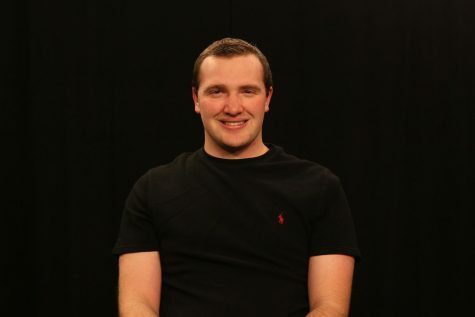 The Colonials got the ball back and George Martin, who came in for Jimmy Walker, found Mathew Barr for a 56-yard touchdown that put them at the six-yard line. Martin found Barr again for the touchdown to make it 42-32 with 2:15 left in the third quarter. Two minutes later, Kevin Greenhow caught the ball and ran 53 yards for his third touchdown on the day. That score made it 42-39, still in favor of Robert Morris and that also ended the third quarter. The Colonials added a score early in the fourth when Alijah Jackson broke free for a 58-yard run. The scoring didn’t stop there though, as Central State added a score of their own, but decided to go for two and failed to convert. That made the score 49-45 in favor of RMU. Robert Morris got the ball back and proceeded to run out the clock. During that drive, Alijah Jackson got over 100-yards rushing to give the Colonials two 100-yard rushers for the first time since 1997. The Colonials win improves them to 2-5 on the year. It is the second time they have beaten a D-II team in as many chances. 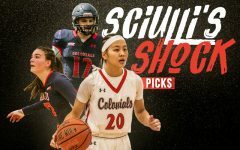 The Colonials have struggled to put away D-II opponents in recent years, but they still managed to come away with their third consecutive victory against a lower division opponent. Next week, Robert Morris will host the Saint Francis Red Flash (2-5, 0-2) who is coming off a loss to 27-20 loss to Duquesne.